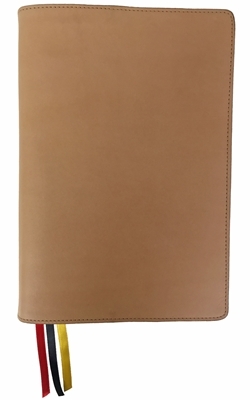 We have found two of the best leather goods companies using the best leathers available to create these exquisite leather slip covers for your Waterproof Bible. We have them custom made in the USA in small batches to fit your Waterproof Bible like a glove. Pockets on the inside of the cover slip over the existing front and back cover of your Waterproof Bible making it easy to put these on and take them off. These are currently sized to only fit our complete Bibles and are destined to become an elegant heirloom. Gfeller Casemakers in Idaho makes this natural vegetable tanned English Kip cover with 3 ribbon markers by hand. Gfeller has been making profoundly functional leather goods since 1946 with geologists and archaeologists trusting Gfeller Casemakers with their most prized instruments since inception. The stitching is a heavy waxed linen that is capable of the most strenuous demands. English kip is a thin, very tight-grained leather that is exceedingly durable. It is sourced from a small tannery in the UK that still produces a fine traditional English Kip. Hides are selected with as few blemishes as possible making the canvas yours to tell your story. The natural tanning does not give the leather color rather enables these covers to patina or darken with age and use. A light coat of pure Neatsfoot oil is applied to lubricate the leather fibers and the rounded edges are hand-burnished to reduce fraying. Gfeller's wax based finish is applied last. This seals the surface to repel dirt and allows buffing out of light scratches. A lightly dampened towel will remove common surface dirt. We recommend moderation in the use of any cleaning product. Avoid anything that smells of petroleum by products.